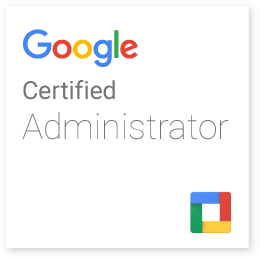 I just took the Google Apps Certified Administrator exam, and passed! There were a number of aspects of the exam that I found really interesting. I’ve taken more than a dozen certification exams of one sort or another over the years. Most of them have been multiple choice. A few have delved into simulations. This was the first I have taken that created an actual work environment as a sandbox to work in. Google created an actual, workable domain just for this exam. That’s pretty amazing. The exam itself consisted of a number of tasks, such as creating users and groups and configuring their permissions. Most of the tasks were either things I had done on my own domain, or might actually need to do in a larger corporate setting. There were no tasks that seemed esoteric or impractical. The entire exam was allowed two hours, and I used almost all of it (although I probably had a good half hour of interruptions during the exam, as I kept my door open the entire time!). The exam was graded algorithmically within a couple minutes, and the only indication I was given of how I did was the ‘pass’ score. I think there’s a lot to be said for this kind of exam. It certainly had one of my favorite exam elements – I learned a lot from taking it! I came across tasks I’d never needed to do before, and learned them on the fly. Which, let’s face it, is how most tech jobs work. Maybe the best part is that all the training needed is online (much of it provided by Google) and free. Literally anyone can learn this and demonstrate some level of competency. Is this the future of online education? I certainly think it will be a part of it.